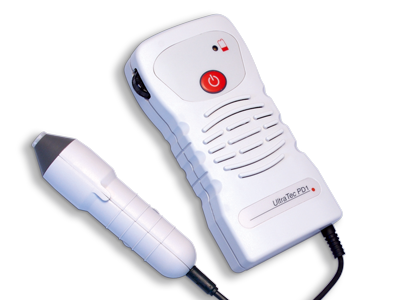 The UltraTec PD1cv is a small, lightweight, high sensitivity pocket Doppler with fixed vascular probes. It is perfectly suited as an entry level Doppler for the General practitioner or emergency nurse as well as Podiatrists, Chiropodists or vascular specialists, for pressure index or routine vascular detection. Choosing a fixed 5 or 8 MHz vascular probe provides an ideal tool for use by a General Practitioner for routine vascular investigation, in ER for vessel location or for monitoring pulses and systolic blood pressure and also by the specialist in diabetes or dermatology. The unit is powered by a standard 9V battery. The PD1cv meets all current EEC standards for medical equipment.